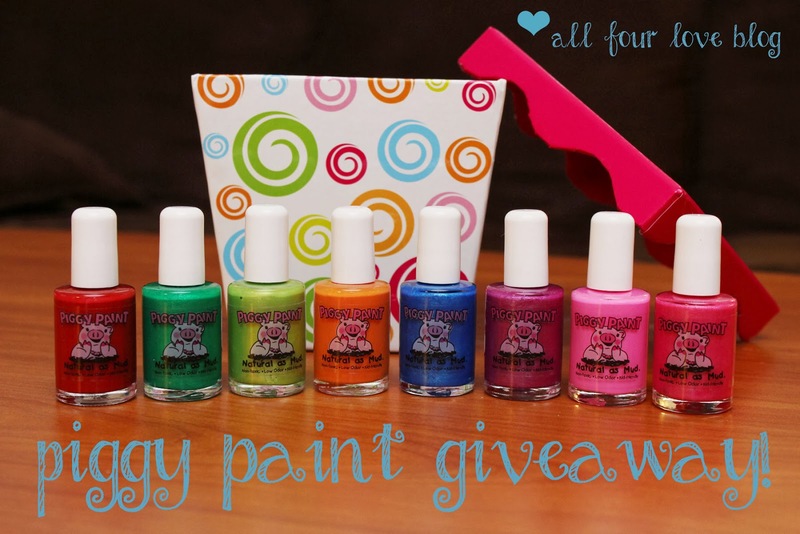 All Four Love: Piggy Paint Review and Giveaway! Here is give away #1 for this month long celebration! Get excited people! Though I don't get to do it very often, I love to paint my nails. Aside from being pretty, it's fun to change up the color and try new things! 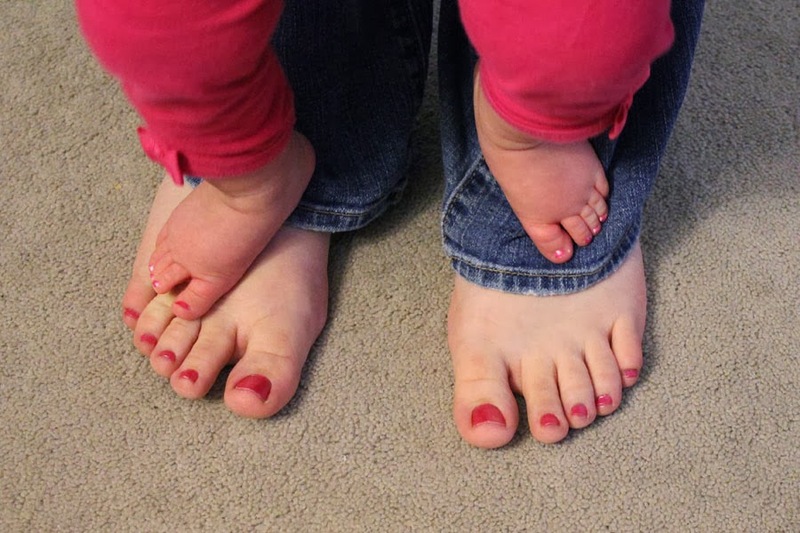 I also love the look of cute little painted baby toes, but most nail polish has some pretty horrible ingredients that aren't good for little ones. The big three are dibutyl phthalate, formaldehyde, and toluene. Granted, these aren't great for adults, but I don't spend the day chewing on my hands and feet. Promise. Excited to paint Ginny's nails with a safe, kid friendly product, I contacted Piggy Paint to team up for a review and giveaway! They sent us a Color Me Happy polish set to try out. Look at all of these fun colors to try out! From left to right...Sometimes Sweet, Ice Cream Dream, Dragon Tears, Mac-n-Cheese Please, Tea Party for Two, Girls Rule!, Jazz It Up, and Forever Fancy. Mom of two manicure loving little girls, Melanie Hurley developed Piggy Paint when she realized just how unhealthy and potentially dangerous regular polish was for children. Where there is a concerned Mom, there is a genius idea! She firmly believes that "...any flammable substance that could cause foam to disintegrate was unacceptable for children's fingernails." We tried out Piggy Paint and it's awesome! I wondered how something water-based could compare to the other polishes I've tried, but I couldn't even tell the difference. It went on smooth with no clumps and dried quickly without being streaky. Piggy Paint recommends their base and top coats for super staying power. Though I did it while I rocked her to sleep one night it was even easy to put on Ginny's itty bitty, nearly non existent toe nails. Yes, I painted her nails by flashlight while she slept on my lap. She's too busy while she's awake to let me do it otherwise! It's absolutely adorable and I can be confident that it is not dangerous for her little body. We chose matching "Forever Fancy" pedicures this time, but I'm sure we'll be changing it up often. We all got into the nail polish action - even Charlie wanted a turn! He pulled off his socks and could hardly decide between the blue, green, and orange. Charlie was the real test of how fast this stuff dries. Two rounds of singing the ABCs and it was dry enough to let him go back to playing! Everyone can use the coupon code, but ONE lucky winner will receive a Glitter Girls nail polish set (MSRP $24.99) which contains three full size bottles of fun glittery polish. Oooh! Colors include Glitter Bug, Fairy Fabulous, and Glamour Girl. Winners must be at least 18 years old and from the continental United States only. There is an exciting new option on this Rafflecopter - an Instagram entry! Piggy Paint would love to know what you and your daughter(s) do for fun together! Snap a picture and share it on Instagram with the hashtag #A4LPiggyPaint. I'm excited to see the pictures! Good luck! I love "Puttin' on the Glitz" So cute! My baby girl just turned 11 months March 3rd! Would love to try these out on her! Like you I will be rocking her to sleep in the dark to do this, LOL! I love some of the names they come up with. I like Mermaid in the Shade and Mac and Cheese. I'd love to use Mac-n-Cheese Please on my nails or my daughter's ! Saw this entry on the SITS facebook post btw. I've always wanted to try Piggy Paint with my daughter, now I'm not sure if she would sit still for long enough! I like the glitter girls set, but would have LOVED to see a St. Patrick's Day themed set. 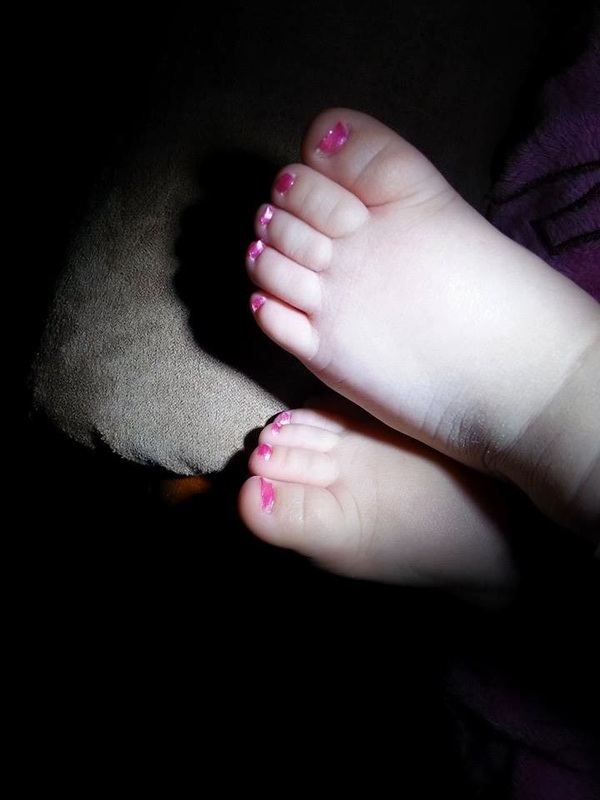 Would love to get a set of nail polish for the baby so she can match her older sister.